Officer and other posts. This Advertisement is being published as per the requisition received from the Department of Transport, Department of Printing and Stationery, Department of Home Affairs and Jail, Department of Town and Country Planning and Department of Industries and Commerce. There are total 68 posts in this Pubjab PSC recruitment 2018. A Competitive exam will be conducted by Punjab PPSC for the candidates selection for the said posts. Last date for online form submission through http://ppsc.gov.in is 21-05-2018. Filled application form to be reachable to PPSC on or before 04-06-2018 with supporting documents. 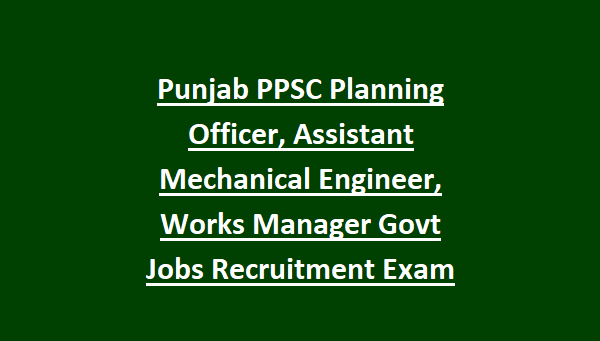 More information about this Punjab PSC recruitment of Planning Officer, Assistant Mechanical Engineer jobs post wise vacancies, qualification, salary, exam pattern and syllabus and other details are given below. Last date for PPSC online form submission is 21-05-2018. Fee payment last date is 28-05-2018. Last date to reach copy of application form to Punjab PSC is 04-06-2018. As on 01-01-2018 candidates age limits are 18-37 years. Upper age limit is 42 years for SC/STBC candidates of Punjab state. For Ex Serviceman upper age limit is as per Ex serviceman norms. Enquiry Officer- Graduate of a recognized University with postgraduate diploma in Personnel Management or Industrial relations of minimum One year's duration with five years experience in an administrative capacity in Govt. or Semi Govt. undertaking. OR Degree in Law with at least three years practice at bar. 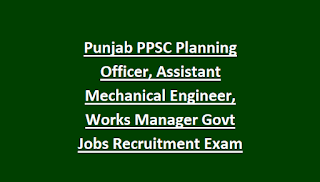 Works Manager -Graduate in Mechanical Engineering from a recognized University with specialization in Automobile Engineering and at least two years experience in supervisory capacity in a Govt. Transport undertaking. Assistant Controller- Possesses a degree of B.Tech/B.E in Printing Technology from a recognized university or Institution and should have two years experience on a supervisory post in the management of a printing press employing not less than one hundred employees. Deputy Controller Possesses a degree of B.Tech/B.E. in Printing Technology from a recognized university or institution and should have three years experience on a supervisory post in the management of a printing press employing not less than two hundred employees. years diploma in Scientific Photography. Planning Officer- Possesses Bachelor's Degree in Town and Country Planning or its equivalent from a recognized university or institution OR Bachelor's Degree in Architecture or its equivalent from a recognized university or institution making the holder eligible for Associate Membership of Institute of Architects. Candidates selection will be based on objective type competitive exam and interview only. Written Exam will be conducted for 340 marks. Total 170 questions will be given and each question carries two marks. Candidates who are interested in these vacancies of PPSC they can apply online on or before the closing date of 21-05-2018. Last date reach the submitted copy to PPSC is 04-06-2018. Online application will be accepted through http://ppsc.gov.in website only.